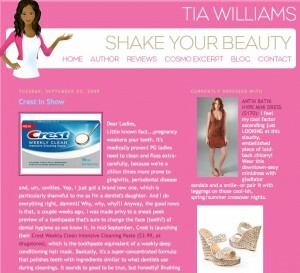 Will the Crest Weekly Toothpaste Launch Work? In a sign that the guys who control ad budgets are getting the value of interactive advertising faster than the agencies that place it, P&G announced recently that they are introducing their new Crest Weekly toothpaste almost entirely through the blogosphere. Samples of Crest Weekly were sent to prominent bloggers (as well as 600,000 Moms) in an effort to trigger an underground viral effect. P&G marketing honchos say that Crest Weekly is an unconventional product. You use it weekly to augment your regular brushing – it has more grit in it to give you that “just back from the dentist, but not numbed or broke” feeling. Thus, it is difficult to explain on TV. While that makes sense, I suspect the famous data hounds at P&G are also cooking up a little test to see if social media can really carry the water for a launch. It appears – at least for now – that it cannot, but results are inconclusive. My search for blog posts, Tweets and other signposts indicating that bloggers indeed used Crest Weekly and wrote about it turned up fairly low volume – although Ariana Huffington’s smile looks a little brighter these days. I found 10 separate blog posts, on well-targeted sites (beauty, women’s, shopping). I also found just one Tweet (from one of the bloggers promoting her post). My favorite among them was Tia Williams’ “Crest In Show” post that artfully wove in her background as the daughter of a dentist. Nice! P&G has not said how many bloggers were given samples, but they did disclose that they began arriving in early August. The product launches in stores next week (mid-September). There are two fundamental problems with the Crest Weekly approach. 1. They actually sent the product out too early. Blogging is a NOW thing, not a “we’re working on the December issue in August” thing. Sending out samples 6 weeks before the product launches when one use of the product will clearly communicate the benefits to the blogger is too long of a lead time. It will be very interesting to see if blog posts about Crest Weekly intensify next week when the product launches. I suspect some bloggers are holding their posts until closer to launch. If you find some new ones on Google Blog Search or Technorati, please let me know. 2. The tactic overwhelmed the strategy. The notion that a major consumer goods manufacturer would launch a product via social media is so novel (for now) that the buzz around it became about the marketing approach rather than about the toothpaste. In fact, there are actually more blog posts (including one more once I click Publish) about the social media launch then about Crest Weekly and its magical teeth scouring properties. Hopefully, P&G won’t interpret this to-date tepid response from the blogosphere as a sign that social media won’t work, and will instead adjust its tactical plan next time around for greater success. In a related story, Kellogg announced today that the ROI on their digital marketing for Special K cereal (blogs, ads, microsite) is superior to the ROI for traditional advertising. While this isn’t shocking to yours truly – a well-targeted and well-executed digital program will almost always beat traditional in a pure ROI fight – for a company like Kellogg to put that information in print (Ad Week) is a quite the watershed. Have you launched a product or brand using heavy social media? Did P&G do the Crest Weekly program right, or wrong? Please tell us your story in the comments.